Call for Entries for the 2019 Northern California Emmy® Awards! Entry form is located on your membership dashboard. 1. Composites – Minimum of two and no more than five (5) representative segments/reports. Recommend three. Eligibility Area: The San Francisco/Northern California Chapter area (Visalia to the Oregon border), Hawaii and Reno, Nevada. This area encompasses the following Designated Market Areas: 8–San Francisco-Oakland-San Jose, 20–Sacramento-Stockton-Modesto; 54–Fresno-Visalia, 66–Honolulu, 109–Reno, 126–Monterey-Salinas, 132–Chico-Redding, 195–Eureka, and the U.S. Territory of Guam. Eligibility Period: All entries must have been originally distributed in the eligibility area during the awards year, January 1 through December 31, 2018. English/Spanish Language Entries: English and Spanish Language entries are separated per category and judged, scored and awarded individually. Broadcast entries must have been intended to be of ‘primary interest’ to a regional or local audience, within the Chapter’s designated awards area, and must have had their first transmission in that awards area during the eligibility period. Entries must not have been available for viewing by more than 50% of the U.S. television homes during the eligibility year. Entries that are available to more than 50% of the U.S. television homes should be submitted to NATAS’ national awards (see exceptions). Broadband entries must have been intended for consumption and be ‘of primary interest’ to a regional or local audience, within the Chapter’s designated awards area. It is advised that broadband content intended for a wider audience (a national audience) be submitted for consideration in The National Academy of Television Arts & Sciences’ national awards. CONTENT ELIGIBILITY: The interpretation of the Awards Committee is final and absolute. Entries must be submitted as originally shown. There may not be any post-broadcast changes except as noted in the category descriptions. No entry may be submitted to more than one Chapter’s awards. The “first airing” of the entry is the primary determinationof eligibility. COMPOSITES: Except where noted, a composite is defined as a sampling of a minimum of two and no more than five (5) representative segments or elements that convey to a judging panel the scope, breadth, or range of an individual’s talents or of coverage of a special event. The elements within a composite, unless otherwise noted, are to be “as aired” with no internal edits or post production work, such as music or special effects. Demo reels or montages are not allowed. One to two seconds of black between cuts, with no audio or slates must be added to separate segments within the composite. Unless otherwise noted, a straight lift from a long work may be included as an element of a composite, but there must be no editing of the lift. For program entries, composite ma-y only contain content from one episode of the series, not multiple installments. DOUBLE-DIPPING: No single entry may be submitted in its entirety in more than one programming category. Exceptions are given for content that was part of a full newscast, or included as an excerpt in the “Overall/News Excellence, category. To be eligible for this exception in the newscast categories, the same entrant cannot be listed on the newscast entry and then use the same material and enter in another programming category. WHO CAN ENTER: Membership in The National Academy of Television Arts & Sciences is not required to enter the Emmy® Awards. Management, producers, designated award directors or individual craft entrants, whether they are a NATAS member or not, may submit entries on behalf of their program, talent or craft. If submitting on behalf of another individual (s), you must fully confirm that the parties contained in the submission have complete knowledge of all eligibility rules, and have viewed and given consent to the content submitted on their behalf. Further, once the Emmy® awards ceremony has concluded, NO individual names can be added to an awarded entry as an additional recipient, regardless of the reason or special circumstances. PROMOTION: All publicity, advertising or any written reference undertaken by nominees and award recipients to the Emmy® Awards, must clearly state that the awarded achievement is for a Regional Emmy® Award. The word “Regional” must appear in these instances. The recipient of a nomination or an Emmy® Award may refer in advertising and publicity to the fact that they have been honored only for one year after the recognition was bestowed. They may use a replica of the Emmy® statuette in such advertising. Individuals who significantly contributed to the production or craft but were not honored with a statuette cannot specifically advertise they are an Emmy® award recipient. They can only state they worked on the recognized program. Entrants may submit as many different entries per program in English Categories 5-23 and Spanish Categories 55-73 as desired. There is a maximum quota of 12 submitting individuals who are eligible to receive a statuette per entry without further written permission. This request must be from the primary entrant detailing how the additional entrants specifically contributed to the Emmy®-worthiness of the entry. Except for the craft areas, the primary person responsible for submitting the program or segment is the producer who must enter. He or she must concur that the additional entrants were also active participants. Executive Producers acting solely as administrators, (i.e., without having hands-on or creative input) of entered programs or segments are not eligible for statuettes. 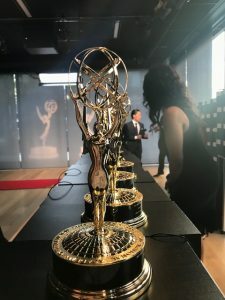 Emmy® entrants are limited to the persons who significantly participated in the creative process of the program; i.e., producer, director, photographer, writer, editor, etc. A complete program or segment may be entered only once in English Categories 5-23 or Spanish Categories 55-73. Producers cannot enter the same material in any of these categories as program and segment producers. The same entrant cannot enter the same material in both news and program craft categories. A multi-part series on the same topic can only be entered once in Categories 5-23 (English) or Categories 56-73 (Spanish). For example, you are not eligible to enter parts 1-3 in one category and part 4 in a different category. For original programs longer than 30 minutes in length and not noted as having a time limit of 60 minutes, you have the option of submitting the first 30 minutes of the program or a composite of 3 unedited segments/lifts. The 3 excerpts must be the opening, middle and ending of the entry. Each excerpt should be approximately 10 minutes for a maximum total of 30 minutes. Content must be entered in appropriate categories. For instance, an investigative report cannot be entered in the Lifestyle category, nor can a sports report be entered in Arts and Entertainment. Program Specialty Categories 12-23 (English) or Categories 63-73 (Spanish) are not intended for stories that are investigative in nature. By definition, investigative stories include but are not limited to newsgathering techniques such as undercover or hidden camera video, public records requests or data-based journalism. The academy considers stories produced by a member of an investigative team to be investigative in nature. Investigative stories are generally not features. An entrant may petition the Awards Committee to allow them to enter an investigative story in a program specialty category. However, the entrant will have to explain why the story should not be entered in one of the designated News Programing categories. For example, a story may have been branded investigative by the station supers or anchor intro, but a reporter may petition the Awards Committee for an exception explaining that they did not use any investigative resources to produce the story. Program Specialty Categories 12-23 (English) and Categories 63-73 (Spanish) are also not intended for sports reports. Sports reports are programs produced as part of a daily or weekly sports program or newscast. An entrant may petition the Awards Committee to allow them to enter a sports story in a program specialty category. However, the entrant will have to explain why the story should not be entered in one of the designated News Programing or Sports categories. An example might be that a sports reporter covered a sidebar lifestyle or historical story that had nothing to do with the game or the athletes. Entry Procedure: All entrants must submit a fully completed entry form (complete Online at www.emmysf.tv), the applicable entry fee(s), and upload their entry through JW Platform as “aired,” except for removing commercials. The total running time and air date(s) of each entry must be provided on the entry form. As an aid to judges, a précis (written description of your entry) may be submitted stating why the entry is award-worthy. Space is provided on the entry form, up to 100 words, for this purpose. Enter online in the “description” section. This précis information will automatically be included on the ballot and read by judges prior to viewing. In Categories 5-23 (English) or Categories 55-73 (Spanish), a member of the production team may submit the entry if the submission is accompanied by a note naming the producer and stating that he/she has declined to participate. Entry Format: After completing the Emmy® Express online entry form, you will be prompted to upload your video. Just follow the step by step process. The best quality of encoding is 1920×1080 or 1280x720p; should be a minimum 720×480. Do NOT letterbox your video. Depending on the length of your entry and your internet connection, the upload may take a long time. Click the Clear Session button before starting a reload. Do not close your browser until the status bar tells you the upload is complete. You must view and approve your video for final submission. All judging and balloting of your entry is done online. Please contact the National Academy Chapter office if you have a problem with the online entry or the uploading instructions. Entrants are responsible for the technical quality of their entries. Entry Fees: The appropriate member or non-member entry fee is required for each person listed as an entrant. *Your membership must be paid through 2019 prior to completing the entry form to receive the member rate. If you are joining NATAS for the first time or are a returning member, you must pay membership dues prior to completing the entry form to receive the member rates. Payment: Credit/Debit Card, American Express, VISA, MasterCard or Discovery. Membership in The National Academy of Television Arts & Sciences is not required to enter the Emmy® Awards. *By joining the National Academy you save $20 on your first entry and up to $130 on additional entries. See online membership form for dues fees based on market area. If you were not a member in good standing during 2018, you must re-join NATAS as a new/returning member. Winning Entry Broadcast Waiver: I (we) agree by submitting and therefore entering my/our Emmy® entry, grant the Chapter the following: Full and complete authority for the Chapter to broadcast, edit, and or make any other changes they deem necessary to my/our entry at their sole discretion. The Chapter is granted full and complete authority to include my/our entry in an Emmy® broadcast, other related broadcasts, and Emmy® website streaming. WARNING: After the January 11th entry deadline, any entry or entrant that is still incomplete (including membership and entry fees) will be subject to a $25 reprocessing charge or disqualification. If an entry must be reprocessed, the original entry fee will not be returned. Sunday, March 31st, will be the FINAL date to submit changes or omissions to entries. Awards Procedure: The Awards Committee is vested with the authority to determine the eligibility of entries and to change any entry’s category if improperly submitted. Such decisions are final. To that end, the Awards Committee will have a master list of entries available on-line for review on or about Monday, January 21. All interested parties should review this list for accuracy as to entrant names, titles, and appropriate fees. Each station or organization will be asked to have a contact person available to answer questions that arise regarding its entries. The Awards Committee will meet the weekend of January 25 & 27 for final certification of all entries. Nominations: Emmy® nominations will be announced in a live webcast at 8 am on Wednesday, May 8, 2019 (www.emmysf.tv). Each person nominated receives a certificate, suitable for framing. Nomination Certificates will be available at nominations parties or may be pickup at the Emmy® Awards Gala. The Award: Emmy® Gala 2019, Saturday, June 8th SFJAZZ Center, San Francisco. Advanced reservations to this Black Tie Event are required. At the Awards Ceremony, only one individual may be designated to give a brief acceptance speech on behalf of all the recipients for the entry. All recipients will have the opportunity to be interviewed on the red carpet. The awards presentation and red carpet will be webcast. 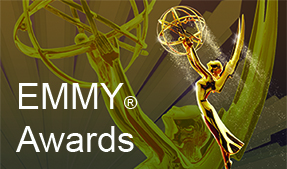 Emmy® statuettes will be awarded only to those individuals listed on the entry form. Remember, the last date to add names is Sunday, March 31st After the Awards presentation, production certificates or plaques may be ordered to honor those individuals the recipients feel contributed to their award-winning entry. These certificates and plaques are available from the chapter office. Please use Upper and Lower Case when filling out your entry form and membership application. The name you use on your membership application will show on your entry forms. We are accepting entries from the S. Territory of Guam. There is a maximum quota of 12 eligible names allowed per entry without further written permission. Any additional names will require a written request from the primary entrant detailing how the additional entrants specifically contributed to the Emmy®-worthiness of the entry. By entering, all entrants agree to be peer judges for categories submitted from other NATAS chapters. Members who do not judge within a 24-month period will forfeit their member discount and will be required to pay the full non-member Emmy® entry fee for each entry they submit until they serve as a judge. The person filling out the entry form is responsible for the video upload. A $25 processing fee will be added to all fees not paid by the end of the grace period. No Montages are allowed. Segments must be separated by one to two econds of black. Content that is included in these categories could be entered in a second category, but not in its entirety. To be eligible for this exception in the newscast categories, the same entrant cannot be listed on the newscast entry and then use the same material and enter in another programming category. Content must be entered in appropriate categories. For instance, an investigative report cannot be entered in the Lifestyle category, nor can a sports report be entered in Arts and Entertainment. The Awards Committee has the authority to disqualify or move an entry submitted in an inappropriate category. Program Specialty Categories 12-20 (English) and Categories 63-73 (Spanish) are not intended for stories that are investigative in nature or sport reports. An entrant may petition the Awards Committee to allow them to enter an investigative or sports story in a program specialty category. However, the entrant will have to explain why the story should not be entered in one of the designated News Programing or Sports categories. Stories that include investigative newsgathering techniques like undercover or hidden camera video, public records requests or data-based journalism, and stories that are produced by a member of an investigative team may be considered investigative in nature. Reports that include coverage of athletics, that aired in a daily or weekly sports program or newscast; or as part of a sports special, may be considered sports stories. You may change the category of an entry until Friday, January 25, 2019. There is a $25 processing fee. Refunds are subject to a $25 processing fee.